Food, oh food. A few weeks into your pregnancy, you probably begin to have a love/hate relationship with this most basic necessity. On the one hand, you can’t seem to get enough to eat. Somehow you are suddenly ravishing and must.eat.right.now! On the other, the idea of actually fixing or cooking any kind of food just makes you want to take a nap, and when you open the fridge you have to turn around and heave (dry or not) over the sink. That’s the thing about the first trimester — you never know what you’re going to feel like eating or not eating, and it can easily change moment by moment. At least it did for me. With all of my pregnancies I’ve had a hard time with food in the first trimester. With my first two, I had the general nausea and food aversions and cravings, but fortunately was never physically sick. This pregnancy was a different story altogether, I was never quite sure when I was going to need to run to the bathroom, but for a while it was an every day occurrence. Because of all of that, and the fact that every woman and each pregnancy are different, it’s hard to talk about food and pregnancy, especially during the first trimester. But, that doesn’t mean we shouldn’t talk about it, or that we still shouldn’t try to eat as well as we can. The most important thing to remember is to give yourself a lot of grace in the process! It may not be easy for you, and you probably won’t eat as well as you’d ideally like to all of the time. And that’s okay. I recently started reading Real Food for Mother and Baby by Nina Planck. I had the book from when I started Bren on solid food with Baby Led Weaning, but had forgotten about reading it for pregnancy. I wish that I had started reading it sooner though, because it really gives the best advice for eating during pregnancy that I have read so far. She talks about what is happening with the baby during each stage of pregnancy, and the necessary nutrients that go along with the baby’s growth and development, and gives her recommendations for what to eat based on that — it makes total common sense to me. So, during the first trimester, the baby’s organs are forming, which are made up of micro-nutrients, or vitamins. Planck says that there is really no reason to eat any thing more, or anything specific, just to eat as well as you can. Your baby can use the vitamins in the food you eat, even if you don’t eat much, as well as the vitamins you have built up in the stores of your body. But, she also warns against eating crappy food. She says not to waste calories on junk food because it doesn’t provide any nutrition for your baby, and may deplete you of certain nutrients. She especially warns about staying away from sugar and white flour, as they can deplete your B vitamins, which are essential during the first trimester. And of course, taking a good prenatal supplement can help to make all of us nervous mothers-to-be a little more relaxed knowing that even if we aren’t eating perfectly, our baby still has access to the vitamins and nutrients he needs. She especially recommends taking cod liver oil during the first trimester for the vitamins A & D, and Brewer’s yeast as a stand in for B vitamins. Some of this I knew during my first trimester, some of it I didn’t – like the fact that what your baby really needs during the first trimester is vitamins, not calories. I’ll be honest that I have a hard time eating as well as I should during the first trimester because the thought of actually preparing any food is just too much for me. Besides pure exhaustion, when I do get hungry I want to eat right then. I don’t want to wait even 10-20 minutes to prepare something, which means I too often turn to prepared foods instead of making things from scratch. I also experienced a sheer lack of motivation during this first trimester, so it was really hard to plan meals (besides the fact that just thinking about food at all made me feel sick). I never really knew what I was actually going to feel like eating, so I would often throw something random together for dinner at the last minute. Not the best plan when you are trying to eat as healthy as possible. I do take a natural pre-natal vitamin, and was glad to read that cod liver oil was an important supplement to take during the first trimester, since that is something I was already taking on a daily basis. Although I find the topic of healthy eating in the first trimester to be a difficult one, I have some ideas to hopefully help you eat as well as possible during your first trimester. When you first find out you’re pregnant, you’ll probably still be feeling pretty good, and won’t develop the exhaustion, lack of motivation, nausea and food aversions for a least a week or two. If you can, try to set aside some time to plan out some easy pantry or freezer meals to help make sure you have something on hand when you just don’t have the energy, or stomach, to cook. Also maybe set aside a day to do some food prep, or freezer cooking, ahead of time. A little planning and preparing can go along way to help you to eat healthier during those first few weeks. We talked about this one before, with surviving the first trimester, so if you are lucky enough to have some friends and family that would be willing to help out, ask if some of them could prepare a few healthy meals for you. Or ask if they’d be will to come over and help you put together some freezer meals for you to use in the coming weeks. Again, it’s much easier to eat something that’s already prepared (at least in my experience) and this way you can know you’re getting something more healthy than the prepared foods from the store or drive- through window. When you do go grocery shopping, try to think about fast and easy foods that don’t need much preparation – fruits and veggies are an obvious choice, most you can just wash and eat. I usually buy heads of romaine lettuce for salad, but found during the first trimester that even cutting up lettuce was too much for me, so I started buying packages of salad mix, so that I could still eat salad without having to do the work. I usually make my own yogurt, but again, as easy as that task is, it seemed daunting, so I started buying tubs of plain organic yogurt. Eating store-bought yogurt is better than eating none at all. And, of course, since we are trying to avoid toxins during pregnancy as much as possible, be sure to choose organic food when you can. Organic meat and dairy are important if you can afford them, or at least seek out brands that don’t use added hormones or antibiotics. Also, use the dirty dozen and clean 15 lists to help you decide which produce to purchase organically, and which you can buy conventional. This will help you to prioritize your dollars on good, healthy food. Choosing good supplements to take is important to help cover any gaps in your eating if you’re feeling too sick to eat, or any lapses in your healthy eating if you’re experiences weird cravings like I did. There is a great article on Simple Organic that discusses choosing pregnancy supplements. Also be sure to check out the informatie discussion in the comments. Did you experience typical first trimester pregnancy symptoms regarding food? How did you eat as healthy as you could during your first trimester? *Disclosure – There are affiliate links in this post. If you make a purchase through one of my links, I’ll receive a small commission at no extra cost to you. 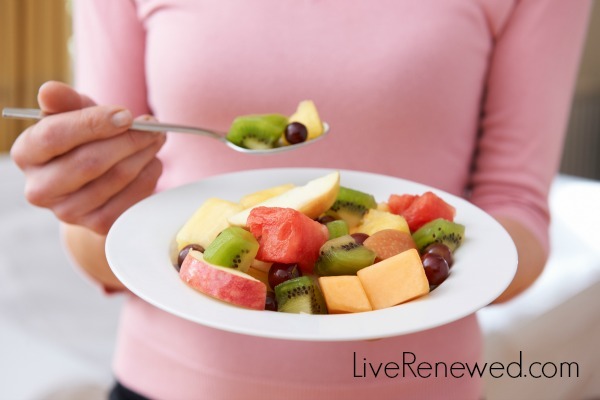 Thanks for supporting Live Renewed! GREAT tips! I was never able to eat well at all during my first trimester. During my first two I had not really discovered the whole foods path and the last time I was just too overwhelmed to try very hard. Luckily, all three are healthy and we are feeding them well now! Yes, Shiree that is so important to remember, I meant to mention that – that even though you might not eat as well as you might like too, babies are quite resilient and you will likely still have a healthy baby! I second #2 Ask For Help. DH did ALL the cooking & cleaning in the kitchen throughout my pregnancy. He would make me whatever I was able to eat and even serve it up and bring it to me. I was totally spoiled, I know. I never would have been able to eat as healthily as I did if I was having to try to not gag while cooking. I believe healthy eating helped me have a great pregnancy. Wow Shannon! What a great hubby you have! My husband did pretty much all of the cleaning during my first trimester, around the house and in the kitchen, but he gets home to late from work to cook for us, that would definitely be nice! I agree with your point about supplements, especially for the Omega 3’s. They are so important for both mom and baby. I also just read Nina Planck’s book Real Food, for mother and baby. It has given me a lot of food for thought for next time around, including a fertility diet as well. I will definitely share this with my sister.. She is 2 months preggy now.. I really think she needs this tips to make her baby healthy..